On Saturday, 4 October 2014 at the 5 o’clock Mass we welcomed Fr Craig Szmidt back to the parish for his presentation in recognition of his three years ministry in the parish. It was lovely to see so many at the Mass as well as the choir and two organists! Even Charlotte came back from University to serve on the Altar for the occasion. The Mass was celebrated beautifully as we have come to expect from Fr Craig. Fr Tony said a few words at the end of Mass, comical as ever, thanking Fr Craig for all he had done during his time here and presented him with his gift from the parish. Afterwards Fr Craig was joined by many parishioners in the garden for a BBQ and Buffet and social chat – a lovely time had by all. On Saturday 12th May, a group of parishioners attended the Diocesan Pilgrimage to Walsingham. We travelled by coach, joined by some parishioners from Kidderminster. Our journey was a very spiritual and prayer filled time, during which we prayed Morning Prayer, the rosary and sang hymns in honour of Our Lady, in both English and Polish to reflect the universal nature of our group and parish. There was also plenty of time to chat and make new friendships along the way. Upon arriving at Walsingham, we were blessed to be invited to join with the Catholic Men's Society as they lead the Stations of the Cross in the grounds of the Shrine. After a picnic lunch in the sunshine, we had some time to visit the Slipper Chapel and pray quietly, bringing our pilgrimage intentions to Our Lady of Walsingham. Holy Mass followed, which was celebrated by Archbishop Bernard. Two of our group served for the Mass and others were reading the bidding prayers and taking the offertory collection. After Mass, we walked along the famous Pilgrim Way in procession behind the statue of Our Lady. Some of our group even walked barefoot, following the centuries old tradition. We prayed the rosary and sung hymns in our parish group; the deluge of rain along the route didn't dampen our spirits and in fact the Archbishop said we were blessed to have been sprinkled with this holy water! We finished in the garden of the Catholic church in the village with some final hymns and prayers and a blessing from the Archbishop. We left Walsingham feeling renewed in our faith and trust in Our Lady's prayers. It was a truly blessed pilgrimage! ...to everyone who worked so hard preparing the Church, and the Mass Centres for the Easter celebrations. A lot of work goes on in the background - often unseen - but it is truly appreciated. Thank you! It was wonderful, albeit windy, to gather at 8.30 p.m. in the presbytery garden on Saturday 19th April for the blessing of the fire at the beginning of the Easter Vigil. During this Mass, the new Paschal Candle was blessed and lit before a procession into a dark Church. Following the singing of the Exultet and the readings from the Old Testament, the Church was illuminated during the Gloria to reveal the beauty of Our Lady of Mount Carmel. Following the his homily, Fr Tony Baptised, Received in the Catholic Church and Confirmed the members of this year's Journey in Faith Group. It was a joyous celebration, and a wonderful way to begin the great Season of Easter. On Palm Sunday, it was announced that Fr Craig will be leaving Our Lady of Mount Carmel during the summer. He has been with us for almost 3 years, and in August 2014, will take up a new position at St John the Evangelist Church, Banbury. The Archbishop has asked him to be an assistant priest with Fr Richard Walker, currently vice rector at St Mary's College, Oscott. Please continue to keep him, and the parish in your prayers during the coming months. Thank you to everyone who work so hard to prepare for Christmas in the parish - at Our Lady of Mount Carmel, St Mary's, Ss Richard & Hubert and Ss John Fisher & St Thomas More. It has, and continues to be, a blessed season for the parish and beyond. On Friday 25th October, the parish of Our Lady of Mount Carmel gathered to celebrate the induction of our new parish priest. Fr Douglas Lamb, the dean of Kidderminster, led us in a wonderful ceremony of induction. During the Rite of Induction, Fr Tony was presented with the keys of the Church, charged with the duty of of preaching the Gospel, and celebrating the Sacraments. Following Mass, there was a buffet in the Marquee. We keep Fr Tony in our prayers, as he begins his ministry in Redditch. Fr Eddie and Fr Michael returned to celebrate Mass at Our Lady of Mount Carmel on Friday 11th October. Fr Michael was the main celebrant, and Fr Eddie preached an inspiring homily. At the end of Mass, Fr Tony presented them both with a gift from the parish community, as a recognition of their hard work in Redditch. We pray for them both, as they begin new roles within the Archdiocese. On Tuesday 16th July 2013, we celebrated our parish Patronal feast of Our Lady of Mount Carmel. Following the morning Mass, there was Exposition of the Blessed Sacrament throughout the day, as part of our annual day of prayer for vocations. 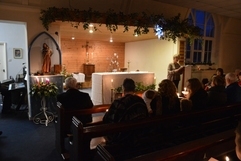 The Main Mass took place at 7.00 p.m. with a full Church, concluding with a procession of Our Lady. Everyone then enjoyed a wonderful BBQ and social in the presbytery garden. It was a wonderful day for all. Thank you to everyone who helped in any way. On Saturday 1st March, we had a retreat day for leaders of Children's Liturgy in the parish. This was the first time we have had a retreat specially for Children's Liturgy leaders and it was a wonderful opportunity for prayer, fellowship and renewal. The retreat was held at St Mary's, Alvechurch and was attended by leaders from both St Mary's and Mount Carmel centres. The day began with an inspiring talk from Fr Craig, encouraging us to fulfil our challenging task of sharing the love of Christ with the children we encounter each week. He reminded us that we can only share the joy of the Gospel with the children if we have experienced it first for ourselves, which we can do through a life of prayer and meditation on the Scriptures throughout the week. We then broke off into a sharing group, during which we discussed the aims and purposes of Children's Liturgy in our parish; a great opportunity to share good practise with others. This was followed by a shared lunch, for which we were joined by Fr Tony, then another group session where we talked about the structure of Children's Liturgy. We were reminded that Children's Liturgy should always mirror the structure of the Liturgy of the Word at Mass so that our sessions with the children prepare them for the time when they will remain in Mass, once they have received their First Holy Communion. The day finished with a time of prayer together, during which we had opportunity for Adoration of the Blessed Sacrament, Divine Mercy prayers and Benediction. All the Children's Liturgy leaders went away renewed in their important ministry. We are grateful to Fr Craig for organising the day and it is hoped that another retreat will take place again in the future. St Stephen was the first Martyr, and is the patron Day of Altar Servers. 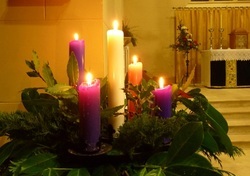 His feast is celebrated each year on 26th December, and is traditionally they day on which new Altar Servers, following a period of preparation and training, are admitted to the Guild of St Stephen. 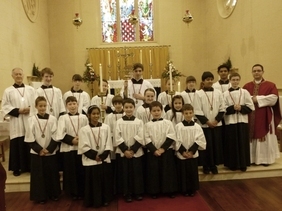 It was quite a sight to 19 Altar Servers on the Sanctuary! We thank them all for their work throughout the year. Feckenham held their annual Scarecrow Festival on 12th /13th October. It is a fun weekend where the villagers make a scarecrow and display it in front of their properties. Neighbours and visitors are invited to vote for the best Scarecrow with a small prize being awarded to winning categories. This year,we decided to join in with the community spirit and enter 'Bishop Bob' from the Catholic community in Feckenham. 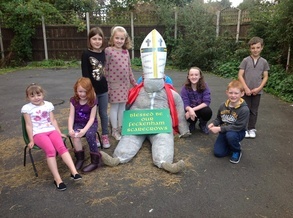 The children and their parents from our Church had fun making a very holy scarecrow. We didn't pick up the wooden spoon for last place but did manage 19 votes.We were beaten by pesky Peppa Pig!